All too often Graves’ disease patients are rushed into a life-altering procedure as this issue is surrounded with fear and pressure. Often time’s patients are scared and make quick decisions under the pressure of their doctor. Unfortunately, these decisions are often not well informed leaving the patient regretting the radioactive or surgical procedure months later, after they have had time to think and get another opinion. Even more unfortunate is once these procedures are done, there is no going back. If you have Graves’ and are reading this, take a deep breath. Allow yourself the time to read this article and obtain a second opinion. In this article I will discuss what Graves’ disease is, what causes it, the risks associated with Graves’ and both conventional and alternative treatment options. It does not matter if you were just diagnosed or if you have had this condition for 10 years and have already had your thyroid removed; you should still read this article for important information on this disease. Graves’ disease is a form of thyroid autoimmunity that causes hyperthyroidism. More specifically, it is a process in which your body makes immune cells that attack your thyroid gland and this attack causes your thyroid to produce excessive amounts of thyroid hormone, causing hyperthyroidism. Hyperthyroid means too much thyroid hormone. What are the signs and symptoms of hyperthyroidism or Graves’? If the hyperthyroidism caused by Graves’ disease is not managed it can cause significant damage. Because one of the symptoms of Grave’s is increased heart rate it can cause problems with your heart including changes in heart rhythm, changes in the structure and function of the heart and even congestive heart failure. If a woman is pregnant with Graves’ it can cause complications such as preterm birth, problems with the child’s thyroid, poor growth or preeclampsia. Thyroid storm is a rare-but life threatening complication of Graves’ in which one becomes severely hyperthyroid. It can cause sudden fever, profuse sweating, delirium, confusion, weakness, tremors, highly irregular heartbeat, low blood pressure and even coma. This is considered a medical emergency and one should seek immediate care. Brittle bones are also associated with untreated Grave’s disease. Those who have one autoimmune disease are at heightened risk to develop another autoimmune disease (1a, 1b, 1c, 1d, 1e, 1f, 1g). Some common autoimmune diseases are; multiple sclerosis, rheumatoid arthritis, type I diabetes, celiac disease, Crohn’s disease and eczema/psoriasis. In fact, autoimmune disease are now more common than cancer (1h). In conventional medicine, thyroid suppressing drugs and beta blockers are usually the initial treatment. Anti-thyroid medications interfere with your thyroids ability to use iodine; iodine is needed to make thyroid hormone so blocking iodine will lower thyroid hormone levels. An example is Tapazone (Methimazole). Conversely, beta blockers do not affect thyroid hormone levels rather they temporarily block the effects of excessive thyroid hormone on the heart. Examples include Propranolol (Inderal), Atenolol (Tenormin), Metoprolol, Nadolol (Corgard). What are the side effects of anti-thyroid drugs? For over 50% of patients these therapies will not work (4) prompting either surgical removal of the thyroid gland or destruction of the gland using radioactive iodine. Radioactive iodine gets absorbed by the thyroid gland and thus causes damage and destruction of the gland. Unfortunately, because the thyroid gland is either removed or destroyed patients usually become hypothyroid, this is actually the goal of either surgery or radioactive iodine. These patients will then require thyroid replacement hormone for the rest of their lives (4). What are the risks of radioactive iodine or surgery? One of the drawbacks to radioactive iodine therapy is the fact that it can worsen eye complications associated with Grave’s disease. There are also risks associated with the surgery including damage to your vocal cords and your parathyroid glands. Unfortunately, most who undergo radioactive iodine or surgery will need thyroid hormone replacement medication for the rest of their lives. For many, these options are far from ideal. Fortunately there are some alternatives to these conventional options. Secondly, we need to investigate the cause of the Graves’ disease. Once we determine and treat the cause your thyroid may return to normal and you will not require any ongoing treatment. To recap, first we buy some time by naturally treating the symptoms and then we fix the problem by treating the cause. What if I have already had my thyroid gland removed or irradiated? It is still a very good idea to read this article and pursue what caused the Graves’ to begin with. Removing or irradiating the thyroid gland does not treat any of the underlying problems that cause this disease. Investigating and treating the cause will help prevent any other forms of autoimmune disease from developing in the future and can significantly increase your overall health and well being. Let’s first discuss how to suppress the hyperthyroidism (treating the symptoms). This would be the natural equivalent of using thyroid suppressing drugs Tapazone, (methimazole) and/or beta blockers [Propranolol (Inderal), Atenolol (Tenormin), Metoprolol, Nadolol (Corgard)]. The authors of this study concluded, “L-carnitine is effective in both reversing and preventing symptoms of hyperthyroidism.” The authors also comment that carnitine can be safely used in pregnant women with Graves’. Additionally they comment that carnitine can be used to prevent and treat even the most severe form of hyperthyroidism known as thyroid storm (5, 6). Carnitine has no known toxicity, contraindications or interactions with other drugs or significant side effect (5). How long until L-carnitine will start working? I have observed patients feeling a difference within days of starting L-carnitine, although the maximum benefit may take weeks to months to realize according to some studies (5). Iodine should not be used as a primary therapy, although it does seem to have utility as a short term addition to help manage hyperthyroidism. One study showed that 150mg per day of potassium iodide led to reversal of hyperthyroidism. The effects, however, were short lived; only lasting for 21 days in some but up to 6 weeks in others. Because of this it appears Iodide is best used as a temporary add on to existing therapies to help dampen a flare up of hyperthyroidism (17). In summary we see four natural medicines as treatment options for managing the hyperthyroidism associated with Graves’ disease. I have found these compounds to be effective for many patients and also to be well tolerated meaning they cause no side effects with the exception to L-carnitine which can cause loose stools in high doses. Fortunately this resolves immediately when decreasing the dose. We have established there are two options (natural and pharmaceutical) for managing the hyperthyroidism aspect of Graves’ in the short term. Why not just try to cover up the symptoms and hope it goes away? The relapse rate for patients who are treated with thyroid suppressing drugs can approach 68%. This means there may be roughly a 70% chance you need to have your thyroid removed or destroyed. This gives weight to how important it is to do everything possible to treat this at the cause (18). This has caused researchers to identify these infections as one of the contributors to developing autoimmunity (19, 20, 21, 22, 23, 24, 25). Some studies have even shown as infection activity increases, so does the severity of the autoimmune process (25). A meta analysis examining the association of H. Pylori infections and thyroid autoimmunity concluded, “Overall, H. pylori infection was associated with autoimmune thyroid disease; the association was significant for Graves’ disease… These findings suggest that H. pylori infection potentially plays a part in the development of ATDs.” (19) ATD means autoimmune thyroid disease (Hashimoto’s and Graves’ being the most common forms). Three case studies were published showing that all three women with Graves’ had concurrent Epstein Barr virus reactivation. Note severe Epstein Barr is also known as mononucleosis. Some researchers are theorizing the reason why Epstein Barr virus might cause autoimmunity is essentially because the virus actually gets inside the thyroid gland thus stimulating your immune cells to attack the gland and cause autoimmunity (27). While we have great studies showing the correlation between infections and autoimmunity; and there is a suggested causal relationship, we are still lacking some data. Published studies showing a decrease of autoimmune activity after treating infections are sparse but impressive. A study was conducted in Italy that illustrated how powerful treatment of infections can be in halting the autoimmune process. Ten patients who had Hashimoto’s autoimmune thyroid disease and also had an H. Pylori infection were selected. Five underwent treatment and five did not. Here is a breakdown of the findings (please note adequate data was only available for three patients from each group) (28). Again the patients all had thyroid disease and a H. Pylori bacterial infection. The three in green (on top) were treated for the infection. The three in red (on bottom) were not treated. The numbers you see are the patients’ levels of TPO antibodies. TPO antibodies tell us how severe the autoimmune process is; the higher the number the higher the damage, under about 35 is ideal. As you see here ALL of the patients’ levels were elevated to start. But, those who underwent treatment for bacteria had a significant drop in their antibody levels while the patients who were not treated did not. So treating an infection helped to dampen or stop the autoimmune process that damages the thyroid. How important are the antibody levels? A large study, known as meta-analyses, showed that high antibodies levels are predictive of Graves’ relapse; so whatever we can do to lower these antibodies will be a good idea (29). While there may not yet be any large scale randomized control trials looking at this, there are many clinicians in the field, myself included, who report that screening for and treating these infections seems to contribute greatly to halting the autoimmune process. It’s a simple inference to draw that removing a pathogenic bacteria overgrowth like Helicobacter Pylori, could be beneficial. Remember Hashimoto’s and Graves’ are immune disorders, infections cause activation of the immune system, clearance of an infection allows the immune system to calm down. The H. Pylori bacterium has been shown to cause stomach burning, ulcers and inflammation. Fortunately, H. Pylori and many of these other infections can be safely eradicated with a course of antibiotic herbs. So there is good reason to screen for and treat these infections especially when we know for certain they have a strong relationship to autoimmunity. Additionally, most every infection will cause fatigue and treating an infection will almost always help with patients energy levels. The subject of infections ties in with that of gut health. Why is this? Well, many of these infections can live in your gut, so this means they act not only as an infection which stimulated the already over stimulated immune systems but also damages your gut. H. Pylori and Yersinia are two examples of this. Why is gut health linked to my thyroid? Well again the connection is via the immune system. Some researchers have said that it is not even possible to develop autoimmunity unless the gut is first damaged (30). But why exactly is this? While we don’t know for sure just yet, there are some highly plausible hypotheses. In this picture you see a sample of intestinal tissue. 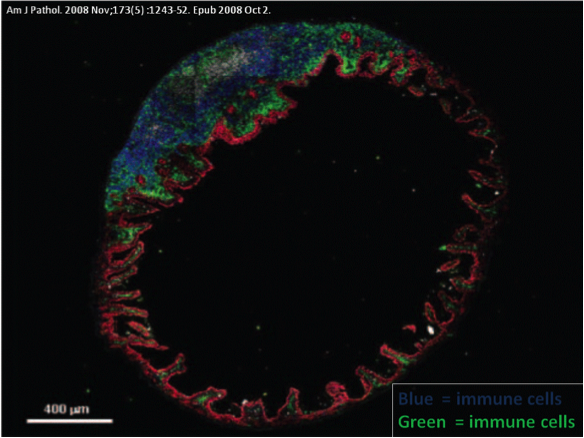 The blue and green cells are immune cells. As you can see there is a tremendous concentration of immune cells in the gut, about 70% of our immune system is contained in gut (31). This is because the gut is the barrier between you and the outside world. Remember ‘stuff’ from the outside world gains entry to your blood stream via the gut so we need to have plenty of border patrol aka immune cells. When you have ‘leaky gut’ the boarder or gut barrier is compromised and too much ‘stuff’ is allowed in. This stuff may be bacteria, viruses, fungus, food particles, chemicals, etc… Well who then comes to the rescue once too much ‘stuff’ gets into your blood? You guessed it, your immune cells. 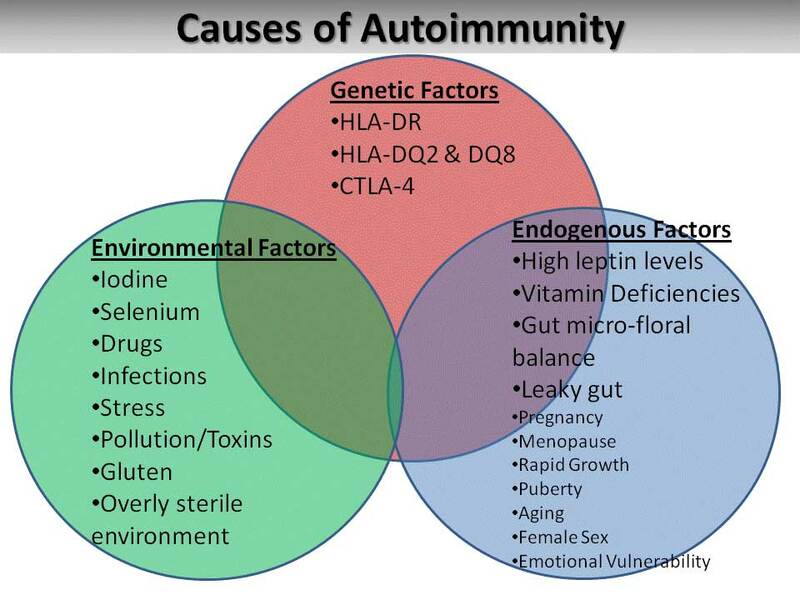 So if you have an underlying predisposition to autoimmunity (see “Gene Factors” in van diagram above) and then you develop leaky gut, the stage may be set for you to develop autoimmunity, or specifically Graves’. I will go into much more detail about this in the book. Here is a very simplified overview of a very exciting and complex topic. Good bacteria and fungus live in your intestines, more so in your colon. They are needed to help crowd out the bad bacteria, fungus and other infections. They are also needed to prevent leaky gut. Additionally they help breakdown nutrients and increase nutrient absorption. As if this isn’t enough, the good microflora has also been shown to have a direct impact on certain types of autoimmunity. Dr. David Brady, ND, DC recorded a very well referenced lecture going into great detail on the gut microflora-autoimmune connection. Brady does a great job covering how the medical literature shows a strong association between gut flora and autoimmunity. Unfortunately, this is seldom mentioned in medical practice. Stress in known to provocate almost any health condition. The effects of stress are far reaching, but specifically stress can effect Graves’ via two main mechanisms. Firstly, stress can weaken your immune system, which can make you more susceptible to acquiring an infection or can cause an infection you already have to become even more problematic. Secondly, we also know that stress modulates what is known as the Th1/Th2 balance in the immune system. One of the predominant theories of autoimmunity suggests that a shift in this balance is a predisposing factor to developing autoimmunity. Gluten intolerance may be connected to autoimmune thyroid, and specifically Graves’ disease by way of a gene or genes. A gene known as the CLTA-4 gene is known to be associated with Graves’. A study published in 2012 showed that 60% of those with AIT (autoimmune thyroid) disease had this gene, while only 25% of healthy controls had this gene (34). How does this link to gluten intolerance? In 2013 a meta-analysis was published showing a link between the CTLA-4 gene and celiac disease, celiac disease being the highest level of gluten intolerance one can have (35). These finding have been confirmed in other reviews as well (36). Other studies, in Hashimoto’s patients, have shown that a gluten free diet can decrease one’s need for medication and dampen the autoimmune attack (37). Irrespective of the exact gene or genes involvement, observational data is fairly clear that those with celiac disease have a high incidence of autoimmune thyroid disease (Graves’ and Hashimoto’s). Now it’s important to mention that there is a growing subset of our population that does not have full blown celiac disease but does have what’s known as ‘gluten intolerance’ (38). Recent medical studies support the idea that those with ‘gluten intolerance’ may also derive health benefit from a gluten free diet (39). Vitamin D is becoming progressively more agreed upon that vitamin D helps fight autoimmunity to a greater or lesser extent. Lets look at a few details. A 2012 study published in the journal Endocrine showed that patients who relapse after Graves’ treatment have lower vitamin D levels, while those who do not relapse have higher levels of vitamin D (40). Interestingly other studies are suggesting that autoimmunity may be due to defects in the vitamin D receptor thus making the vitamin D in your body less effective. A 2013 study performed in Turkey showed that a certain defect in the vitamin D receptor left patients at higher risk for Hashimoto’s thyroid autoimmunity (41). Along these same lines, certain viral infections may actually block the vitamin D receptor and this may be another mechanism through which chronic infections lead to autoimmunity (42). Omega 3 fatty acids have become an important dietary and supplemental considerations because they have become deficient in the diet in industrialized nations. Omega 3s serve numerous functions, regarding autoimmunity the most important function they confer is likely their effect on inflammation. Every cell of your body has a coating around it know as a cell membrane. The cell membrane is comprised of fatty acids. If the cell membrane is composed of too much omega 6 and not enough omega 3 fats, then the cell is more prone in inflammation. Increasing consumption of omega 3s will help restore balance to your cell membranes and make you less prone to inflammation and autoimmunity. But how does inflammation tie in with autoimmunity? Remember one of the hallmarks of autoimmunity is on overzealous immune response. Your body mounts an immune response by sending out white blood cells that essentially shoot inflammation at ‘bad guys’ to destroy them. This is good when it is controlled, but in those with autoimmunity the process rages out of control. Restoring proper levels of omega 3s is like taking bullets out of your immune systems guns thus preventing your immune system from getting out of control. Please remember its all about balance and over consumption of omega 3s may cause problems just like a deficient intake. Some patients have a gene mutation known as the MTHFR mutation. Essentially this mutation decreases one’s ability to break down folic acid. Folic acid is a synthetic form of the naturally occurring vitamin called folate. Because food processing damages folate, the synthetic form (folic acid), is added back to our food. Patients with this gene mutation cannot absorb folic acid and they become deficient in this vitamin. Data on this topic is sparse and I question if treating this gene mutation will have any significant impact on thyroid autoimmunity. Some studies show an association with this mutation and autoimmune thyroid; one study showed that 30% of autoimmune thyroid patients had the MTHFR gene mutation (44). However other studies show no correlation with this specific gene mutation and thyroid autoimmunity (45). Fortunately treating this gene polymorphism is inexpensive and safe as the preferred treatment is via diet and vitamin therapy. While this may not be the first item to address, it may be worthwhile to discuss this with your doctor if your doctor is up to date on this topic. We have reviewed information discussing conventional and natural treatment options. The first and most important action you can take is to undergo “Initial Treatment” for the symptoms of Graves’, the hyperthyroidism. This can be done with natural or pharmaceutical treatments. Once this is achieved you have bought yourself some time to decide on your next step of treatment. The next step is to decide on “Secondary Treatment”; whether conventional or natural treatment will be your choice for addressing the thyroid itself. Likely the most important decision in this whole scenario regards the secondary treatment. Because conventional secondary treatment means permanent loss of your thyroid gland and subsequent need for thyroid medication for the rest of your life (in most cases) many would prefer this as a last resort. Undergoing the functional medicine secondary treatment has the potential to save ones thyroid gland. The main criticism of this approach will be it is less well studied then the conventional approach. This is true, however it has more to do with funding. Natural treatments do not have the large research funding that drug and surgical procedures do. That being said we have covered a fair amount of research supporting the functional medicine approach. The functional medicine approach is natural and has the potential to allow one to avoid permanent loss of their thyroid, so it appears this is a highly logical first choice. You can always have the surgery/radiation later, but once it’s done there is no going back. Hopefully this review of Graves’ disease will enable you to make an informed decision that you feel comfortable with. Feel free to contact my office should you have any questions. 1c. Detection of autoantibodies against actin filaments in celiac disease. 1d. 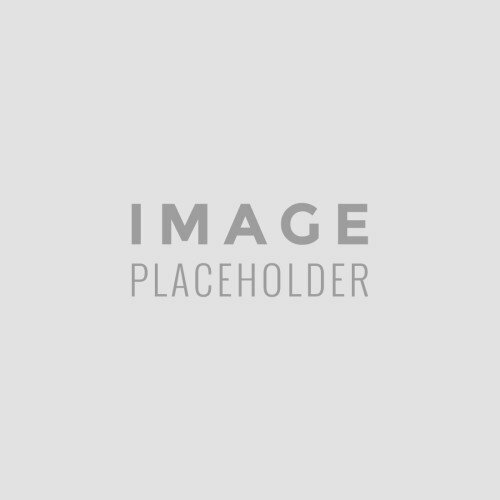 Psoriasis and autoimmune disorders: a review of the literature. 13. Serum selenium is low in newly diagnosed Graves’ disease: a population-based study. 18. Is there a methimazole dose effect on remission rate in Graves’ disease? Results from a long-term prospective study. The European Multicentre Trial Group of the Treatment of Hyperthyroidism with Antithyroid Drugs. 23. Why is the thyroid so prone to autoimmune disease? 25. Homologies between proteins of Borrelia burgdorferi and thyroid autoantigens. 28. Decrease in thyroid autoantibodies after eradication of Helicobacter pylori infection. 29. Meta-analysis evaluation of the impact of thyrotropin receptor antibodies on long term remission after medical therapy of Graves’ disease. 34. CTLA-4 gene polymorphisms and their influence on predisposition to autoimmune thyroid diseases (Graves’ disease and Hashimoto’s thyroiditis). 35. Association between CTLA-4 polymorphisms and susceptibility to Celiac disease: a meta-analysis. 39. Non-celiac wheat sensitivity: separating the wheat from the chat! 41. Vitamin D receptor gene ApaI, TaqI, FokI and BsmI polymorphisms in a group of Turkish patients with Hashimoto’s thyroiditis. 42. Epstein-Barr virus encoded EBNA-3 binds to vitamin D receptor and blocks activation of its target genes. 43. Effects of n-3 fatty acids on autoimmunity and osteoporosis. 45. Association of polymorphisms in DNMT1, DNMT3A, DNMT3B, MTHFR and MTRR genes with global DNA methylation levels and prognosis of autoimmune thyroid disease. thanks so much for the info on graves : I read everything u post about hashimoto having lost my thyroid to it 10 years ago thru my own ignorance of alternative options. Now a good friend has been diagnosed with graves and here in Germany good natural treatments / doctors are hard to find. We are therefore most appreciative of your work and research on the thyroid. How would I get a skype visit? I need help with Hashimotos and daughter 17- Graves dz. Thank you for all the information. I’m meeting with my Doctor tomorrow about my thyroid. I don’t think she knows must about Thyroid we had a phone appointment on Friday. I called kaiser about seeing a thyroid specialist she don’t think I need to see I have a lot of issues you talk about. Yes, you can set up a consultation with my MA or a visit with me. I will have someone from the office reach out to you asap. Thanks so much for this great information. Do you know of any functional medicine practitioners in the UK that follow your treatment approach or do you offer Skype consultations for those abroad too? I dont know of anyone in your area but I do see patients via phone/skype. I will have someone from the office reach out to you. I have a severe case of eczema and it has changed the course of my life. The only way they could finally control it was a steroid. I have had many test all show I’m healthy?? I read your post on the greaves disease but found little on the eczema. What is your suggestion?? I am 39 never had it before and have always been healthy. Thank you so much for your in depth research and options regarding Graves Disease and hyperthyroidism. I am 38 years old and very recently diagnosed. I have seen 6 doctors over 2 years and finally, finally have a direction to go with all my symptoms. It is very difficult to get an appointment with specialists in rural north Louisiana so I will be driving 3hours to Jackson MS tomorrow. I’m very hopeful that the Doctor will be open to alternative medicine since the methamizole taken for 3 weeks caused extensive hives and had to be discontinued today. I am very anxious that my heart rate /rhythm will be affected again but I have concerns about taking the beta blockers suggested. I have been a practicing Physical Therapist Asst for over 17 years and have very strong beliefs about poly pharmacological issues. Your article has given me great hope and direction for coping with these health issues. THANK YOU!!! Hi Donna. Your not alone I suffer from multinodular goitesevere graves disease. I was allergic to both meds as well. Also reacted badly to nadalol and have a betadine allergy. They say my only option left is surgery to remove my whole thyroid. I know thats not the case considering I have previous and continuing other medical issues that they never address and can now just blame it all on the thyroid. They claim I will miracously cure all my other problems with one solution which I know is not true. A specialist will only go based on medical schooling and insurance go hollistic. Save your gland! DR. RUSCIO may I please get an appointment scheduled with me as I need to get these doctors to accept and hold off on my surgery until these options are played out. Graves’ Disease is an auto immune disease that causes the thyroid. Fatigue and weakness are symptoms of Graves’ Disease. Herbal Treatment for Graves’ Disease depends on symptoms. I have had a “thyroid storm” and been put on a beta blocker and thyroid medication until I can see a specialist. My eyes have been bulging for apprx. 6 months and my heart beat is very irregular with palpitations and excessively fast rate. Can these symptoms become permanent or will the natural remedies listed in your article curb these symptoms and regulate my thyroid? Some studies have shown these therapies to be quite helpful, as I outlined in the article. But, this is not a guarantee. I would work with a doc who can walk you through this. If you would like a phone visit with my office, tell them you have Graves’ and they can get you in quickly, we make exceptions and work to squeeze in flaring Graves’ patients quickly. http://www.drruscio.com/resources. Hello and thank you for your article, I am 32 and just got diagnosed with graves almost 2 months ago. I have two lesions on each side of my thyroid and one side is enlarged. I also had a iodine test done and my uptake after 24 hours is 62%. I finally saw the endocrinologist and he is having me do a radiation treatment tomorrow morning. I just ran across your article and thought I should try and reach out. OK, wish you say the article sooner. Feel free to contact my office if you need help, http://www.drruscio.com/resources. I canceled the appointment in hopes you could help me. OK Josh. We will take care of you. I would bring a clinician in to help you with this. Many clinicians offer phone/Skype visits to offer guidance. Feel free to contact my office, I believe its a few months to get in as a new patients but we often will try to find a way for Graves’ patients since timing is important. The doctor said he had never seen results as high as these and wants me start immediately with 30mg of methimazole. I am not crazy about allopathic medicine. I am hesitant to start taking it, the doctor is saying if I am not taking it, it could become life threatening. I started taking a beta blocker, since my heart was racing so fast I couldn’t sleep. I am OK with the use of Methimazole, especially if there is a clear need for it. You can speak with your doctor about the therapies listed in this article to address some of the underlying cause so as to need less of even no Methimazole in the future. Hope this helps. I really appreciate your work! My daughter has Graves Disease. She is 16. She was diagnosed last March. A naturopath discovered her thyroid disease when she ran a panel. The naturopath was inexperienced with thyroid disorders, and she recommended an endocrinologist. I did a tun of research after I found out about her thyroid, and your YouTube channel was so helpful! I love your podcasts, You make so much sense! Your information has helped me avoid some very scary procedures!! The endocrinologist wanted to put her on high dosage beta blockers and ATDs, for a few months, then prep her for the radiated iodine pill, which she described as “no big deal”. Needless to say we didn’t follow her advice and left her office. She did try to threaten me via my daughter’s pediatrician, when I cancelled our next appointment and told her we appreciated her advice, but would like to try another approach that is less invasive. She literally screamed at me on the phone when I told her this. We completely eliminated processed food, and gluten, and found a wonderful homeopath. We have seen much improvement! But her free T4 is just hovering. It started to go down, then it went up just a bit. She eats an all organic local pastured meat, dairy and poultry with as much local fresh fruits and vegetables. She feels much better! But we’re stuck. Our homeopath is now suggesting to possibly use Methimazole if we can’t get levels down. We are hoping to get into see you via Skype ASAP and I have been emailing with Veronica. We to get to the root! She tested high for herpes zoster. I believe her autoimmunity was triggered by the chickenpox vaccine and a high carb processed diet. After gallbladder surgery in February 2016, my voice never recovered and lead to a diagnosis of vocal cord paralysis in June 2016. The extreme stress of not understanding what had happened to me (couldn’t breath, eat or talk properly) and months of investigation lead to an endocrinologist. The endocrinologist told me in October 2016, determined from blood tests she took in August 2016 (which showed high Thyroglobulin) that I had Graves disease. I asked to be treated as it scared me and I was having symptoms along with the vocal cord symptoms of water filled and constantly running eyes, tingling/prickling all over my body and loud ringing in my ears, hair breaking and falling out. None of this was normal. She decided not to treat. Desperately, I looked for help elsewhere. Found a homeopath that put me on selenium and vitamins. My thyroid continues to grow. There was one nodule of 1cm when the original vocal cord diognoses was made, now there are many more. The symptoms have decreased but are still there. Is there anything more I can do to stop the growth of the thyroid nodules and stop my body and ears from humming? Your article is calming and hopeful. I had my thyroid removed through Iodized Radiation I didn’t understand or know that I would need to support it with hormone replacement for life . Hi, I was diagnosed with hyperthyroidism 2 months ago, my endocrine doctor gave me methimazole 10mg twice daily but this is not helping me,. 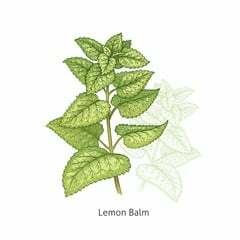 How do I take L-cartinine, selenium, bugleweed n lemon balm? How many mg daily should I take? Is there any formula with all of these in it? Selenium at 200 mcg, Carnitine at 3 tsp per day to start – make sure to check in with a clinician on this. If you need further help contact my office, we try to get Graves’ patients in asap. Dear Dr Ruscio, I’m 28 years old and I was diagnosed with Graves’ disease al,ost 4 months ago, I’m under treatment with Methimazole 20mg QD and propranolol as needed, my values have been decreasing to 3/4 and then 1/2. Recently I started looking for other options to manage this condition as I do not want to take medications for life; reading through your article, I come accross the question wether, even after implementing your recommendations, should I be seen by a rheumatologist to find out of any other autoimmune diseases propensity I may have? Even if Graves is resolved, autoantibodies may develop towards other organs. Thank you so much for sharing and your time. I would still have the evaluation. However, I would also take steps to improve your health as much as possible. The protocol in my book will help you to optimize your gut health, which is a sizable step toward overall immune health. Dear Dr. Ruscio. I was diagnosed with Graves approximately 5 years ago. I originally started with a dose of 20 mg of Methimazole once per day and am now currently alternating 5 mg and 7.5 mg every other day. A year ago my endocrinologist tried weaning me off the medication to see if the disease would go into remission, but doing so caused an imbalance again. I tolerate the medication well, but I would like to try something natural to see if I could eventually go off the Methimazole. Would Selenium be a good option for me? I also have the typical widening of the eyes, or “Graves Stare”, which makes me very self-conscious. It was suggested that taking daily iodine might have initially triggered my hyperthyroidism, so I have avoided all supplements containing iodine ever since. What are your thoughts on this? Also, last May I was diagnosed with breast cancer. Is there any correlation between Graves Disease and breast cancer? I have read contradictory reports regarding both of these issues. I had a mastectomy to remove the existing cancer in May, but I haven chosen to follow a natural protocol to prevent a recurrence instead of chemo, radiation or Tamoxifen. Thank you for your time. Selenium and carnitine may help. Iodine is known to be a trigger of thyroid autoimmunity, so this is possible. I don’t know of any association although I have not researched this. If you are in need of help feel free to contact the office for a tele-med consult. Hope this helps. I was just diagnosed with Graves disease yesterday. I am 49 years old. Vegan already. Runner. However, I am also an artist exposed myself to various chemicals and I have a tendency to stress myself. I already bought all the supplements you mentioned above, am signing up for a meditation class and therapy to deal with stress. Now I just don’t know what to do about the treatment itself. My Dr is pushing the most common iodine on me. I could cry thinking about it. My eyes are very important to me as well. I could use some serious advice. Help. The article is a good place to start. Of you can contact my office 🙂 I’ll help however I can. I was diagnosed with Graves in January 2018. It took until the end of April to get in with the endocrinologist. I am taking 15mg of the thyroid medicine and a twice daily beta blocker. I have tolerated everything quite well. I am very confused as to how I will proceed with the secondary treatment. My immediate goal is to get my system to calm down. I believe that an unheathly eating lifestyle, stress(due to extended family and a move), and a viral stomach bug triggered it. I used to work with 2 people who had Graves and they both tolerated the radiation well. One went on to have 5 kids! I think alternative supplements are worth a shot, but PLEASE do not stress about your final decision. Stress is how I got here so I’m trying my best to control it! I am going to be cutting out gluten. I think this is just unnecessary in my diet and probably causing more harm than anything. My doctor did say that even if you treat with radiation or removal, watch your eyes!!! Eye problems can start years (he said as many as 7 years) after successful treatment. Take care! I’m wondering if I started to read this article too late? Lol. I’ve had Grave’s for almost 5 years. I was responding well to tapazole and went into “remission”. 6 moths ago I had blood work and my levels were not good. I started on tapazole again and my thyroid hasn’t responded much at all to it. Killing my thyroid scares me, is this really my only option? What do I do? I am 71 years old and was diagnosed with Graves Disease in Nov. 2017. Unfortunately neither of the two medications (Neo Mercazole and PTU) are able to be tolerated by me. One affected my liver and the other resulted in an eczema like rash all over by body. The doctors have scheduled me in for an operation within 90 days and this is not sitting very comfortably with me. I have been basically a-symptomatic for the past month or so, apart from the A-fib and sometimes weakness (not being able to walk/dance) but this passes. I am also taking herbs from a Chinese Herbalist. I did try a naturopath but I did not feel I was improving. If I show the Naturopath your site and ask that he treat me with what you have suggested, would it be detrimental to my health if I asked that the operation be put off. Up until the diagnosis last November, I was a very healthy woman, taking no other medications. It is such a worrisome predicament, especially as the doctors say my heart may be damaged if I do not have the operation. Also, are you able to suggest the dosages for the natural treatments you have put up on your website? I will go out and purchase supplements immediately and hopefully the L-carn. will have a good effect by the 25 July which is when I have he next visit with the hospital endocrinologist and will support my case for not having the operation until I have tried the alternative path. Looking very much forward to hearing your response – and Thank you for providing this information to the community. Selenium at 200 mcg, Carnitine at 3 tsp per day to start – but make sure to check in with a clinician on this. Have you helped people with not only Graves Disease but Graves Opthamology? Also my son is constantly itching due to severe eczema/hives and joint pain. He is 21years old and my heart breaks for him. What typically causes this and have you helped others. No. But selenium has been shown helpful. I have had Graves disease for 9 years now, I have been on Methimazole for about 3yrs. Just reasently I ended up in the hospital because my white blood cell count dropped to a 1. As you know it’s supposed to be between 3-5. They stopped the Methimazole because it caused the white blood cell count to drop. Now my doctor tells me that my only two options are surgery or radiation. I don’t want to do either of them. Can you tell me where I can get the list of natural things to reverse the Graves. How much to take and so on? Do I go to my local health food store? Any advice you can give me would be wonderful. Thank you! For dosages, he recommends selenium at 200 mcg, Carnitine at 3 tsp per day to start – but again, this should be done under the care of a clinician. I was diagnosed with Graves a few months ago. I have been on Methimazole for about 3 months now at 20 milligrams a day. Latest blood work came back today and said there has not been an improvement since the last blood test 1 month ago. In addition to the Methimazole, I also take a Super B Complex vitamin, Vitamin D, glucosamine chondroitin, a probiotic and zinc everyday! I was taking Selenium as well but my Endocrinologist told me to stop taking it. However, everything I read about Graves tells me that Selenium is good to take. I want to start taking it again because I am getting the feeling that my Dr. wants me to kill the thyroid since there is more $$ to be made for her that way.. Am I wrong?? Also should I add the suggested supplements you suggested (bugleweed, lemon balm and L-Carnitine) to my routein as well along with the Methimazole? Ill try and do anything not to have my thyroid killed or removed..
Also.. I was gluten free for about 2 months and my Endo told me that I didnt have to do that either.. I try not to eat it anyway though.. should I find another Dr?? I work in a professional racing field and need to get this corrected asap! Having a practitioner you feel comfortable with and confident in is going to be key for getting good results. We can’t give personalized medical advice here and it’s important to work with someone who knows your history and how all your potential medications and supplements could interact with each other. I was recently diagnosed with Graves. Lots of pressure from the doctors to take the radioactive iodine. I believe my situation was caused by extreme stress. (I had shingles not long before the Graves diagnosis. I am only 40ys old.) I would like to try the herbs and supplements listed in this article. Thank you for making me feel like I have time to make an educated decision. Hei! Jeg har nettopp fått vite at jeg har denne sykdommen og er vettskremt fordi øytnene mine er så hovne, livredd for å ikke bli bra for dette, og har det helt forferdelig. Hi! I have just learned that I have this disease and are terrified because my eyes are so swollen, lifesavered to not get well for this and it’s terribly awful. I would suggest finding a qualified practitioner who is experienced with this condition. hi doctor, i was diagnosed with thyroid eye disease, my left eye is inflamed since decmeber 2017. All my thyroid tests shown normal, infact biopsy was done on my eye muscle and gland but it shows no disease found. I checked with 3 doctors already unfortunately none had given me a light to this problem. i took steroids for 4 months under 40mg (since my weight is 37kg), unfortunately, it didnt help relieve the inflmation until they asked me to stop using it.. i am now with no medication, no guide even on supplements to take, i am taking fish oil, selenium and turmeric supplements based on my own research, i am totally unsure about this but im getting despirate. i need help. I’m sorry you’re dealing with this right now. I’d definitely recommend contacting Dr Ruscio’s office and setting up a consult. They have a relatively long waiting list right now, but sometimes they try and get Grave’s patients in earlier since it’s a time-sensitive condition. Thanks for so many detailed explanations Dr! I have Grave’s and took Methimazole for one full year my Thyroid level is stable. It’s been stable for more than six months now. My doctor reduced the dose of Methimazole gradually and now she says she will suspend it. Do you recommend I should start taking selenium from now on? If I take selenium from now on will I be able to get pregnant? I am 41 years old. Thanks in advance Dr Ruscio. There shouldn’t be any reason selenium would negatively impact fertility, but it’s definitely important to talk to your doctor about potential supplements before you start taking them, especially with pregnancy and nursing. Hello, my fiance suffers from Graves Thyroid Eye Diesease. He sometimes wakes up and can barely open his eyes because of how severely swollen they are. Do you treat patients with TED? He lives in Vegas. Thank you for this important information..I am a 60 year old female and was just diagnosed with Graves 9/11 this year ( what a day to get the news). I didn’t feel good about the scan in nuclear medicine and cancelled two times. I talked with my Dr. office and asked if it was 100% necessary as I had been given a diagnose already via blood work. So she OKed starting the Methimazole at 10 mg 2xs a day due to the number of antibodies. I am supposed to start first pill tomorrow. I am not crazy about the idea of taking it the rest of my life or the side affects. How would you suggest me going forward? Should I take the medication with the natural options? How much Bugle weed, lemon balm, and iodine? Hi Dr. Ruscio, I have had Grave’s Hyperthyroidism since 2003. I was treated with methimazole. In 2016, my TSH went down to < 0.005 for over a year. Finally, I had a total thyroidectomy in May of 2017. A pathology report done after the total thyroidectomy, revealed that I also had undiagnosed Hashimoto's. My endocrinologist said it doesn't matter now for I don't have a thyroid any more. I "assumed" that since I had a total thyroidectomy and am on 125mcg of levothyroxine for life that I would not have to be concerned about developing Grave's Thyroid Eye Disease. Wrong. I now have Grave's TED (mild); had an orbital/brain MRI showing that it is TED; my thyroid antibody level is high ~400+. Treatment recommendations are to quit smoking and I'm taking 200 mcg of selenium per day. Why did I develop TED after a total thyroidectomy? How do I stop the TED? I’m sorry to hear you’re dealing with that. I’m not sure why that could have happened and Dr Ruscio doesn’t specialize in TED. However, the treatment recommendations seem like sound advice, as well as working with a qualified practitioner. I was exposed to chemicals in August 2018 then had a chemical lung burn and took several medications in September to counter it. On October 9 I was diagnosed with hyperthyroidism. I’m certain all those chemicals and medications adversely affected my thyroid. I don’t want to object my thyroid with radioactive material. I’m 49 years old and this came out of nowhere. What dosage of L carniteme, Selenium, Bugleweed and Lemon balm, and Iodine should I start with? What else should I take? Since you are booked into July next year, I need to begin treatment now and can’t wait that long. My symptoms are awful. Thanks so much for all your great work in this area and thanks in advance for your suggestions. I’m so sorry to hear you’re dealing with this. Your best bet would definitely be to work with a qualified practitioner and not try to self-treat. Feel free to call the office to try and set up an appointment – often times with Graves’, they work to get patients in sooner, since it’s so time sensitive. For selenium, he usually recommends starting at 200 mcg, and 3 tsp of carnitine to start (I’m not sure about the others) – but again, this should definitely be done under the care of a doctor. Good luck! Could you direct me to further resource for healing after Radioactive Iodine? I gained over 100 pounds in 18 months afterward and have been very Ill since treatment, which occurred 27 years ago. Specifically need to know how to support thyroid receptors in body that would have been knocked out with RI. I have a significant amount of inflammation in my body and also since ri of graves have celiac. Pcos, high BP, sleep apnea, etc..
Hi, I’m 22 weeks pregnant and have mild hyperthyroidism, endocrinologist says I dont need medication, but I’m starting to realize my eye lids are puffy. I dont want to take medication if I dont have to. I read in the above article that taking selenium and l carnitine while pregnant is safe, do you think taking those supplements will help with hyperthyroidism and puffy eye? Both of those supplements have been shown to help with hyperthyroidism, but I can’t speak to those two specifically on puffy eyes. Especially since you’re pregnant, you should speak with your doctor before starting anything new. It may be helpful to print out this article and bring it in to your next appointment. Good luck!